In the previous post about the Polaroid XS100i, I introduced the camera and its accompanying mounting accessories. 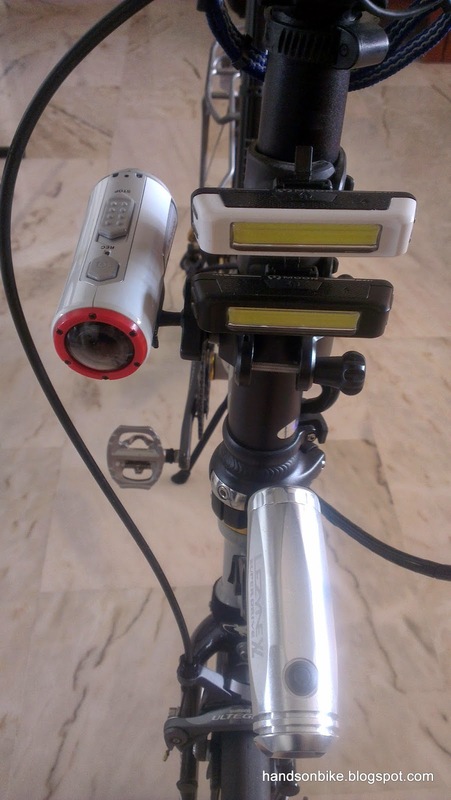 Since then, I have tried the camera out on a couple of bikes, and using different mountings. With that experience gained, I can now give a better in depth review of the camera and its functions. First, I would like to start with the wifi capability of the camera. With wifi, I can connect my smartphone to the camera easily. There are two separate apps for this. The first is to allow you to access your content on the camera from your phone. This means that you can download photos or videos from the camera to your phone without any connecting cables. 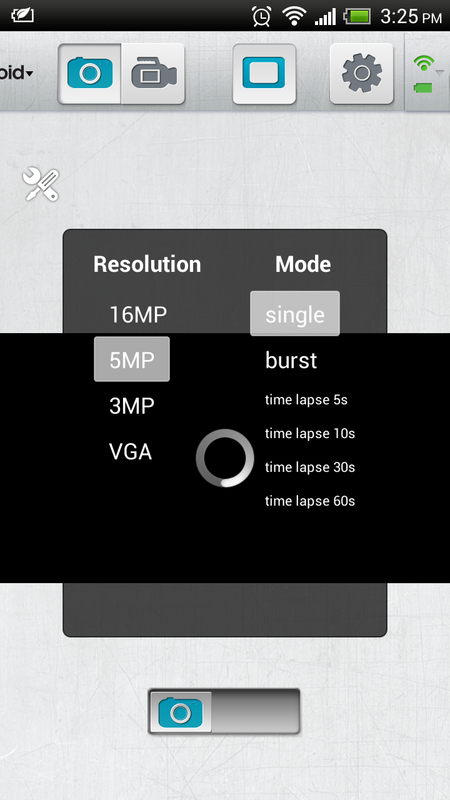 The other app is for adjusting the settings on the camera. In the screenshots below, I will give a more detailed explanation on the various functions and settings available. In the photo mode as seen on the phone. You can take a picture on the Polaroid just by pressing the shutter button on the phone (at bottom of screen). The picture that you see on the phone app is a "live" video of what the camera sees! There is a noticeable lag of 1-2 seconds, which can increase to 10 seconds or so the longer the app is on. Not too useful for live streaming, but good for adjusting the camera's field of vision. Another thing that I am quite impressed with is the field of view of the camera. In the picture above, the camera was actually placed just 50cm away from the bike! However, the camera managed to cover practically the whole length of the bike. This corresponds well to the claimed 170 degrees field of vision for this camera. 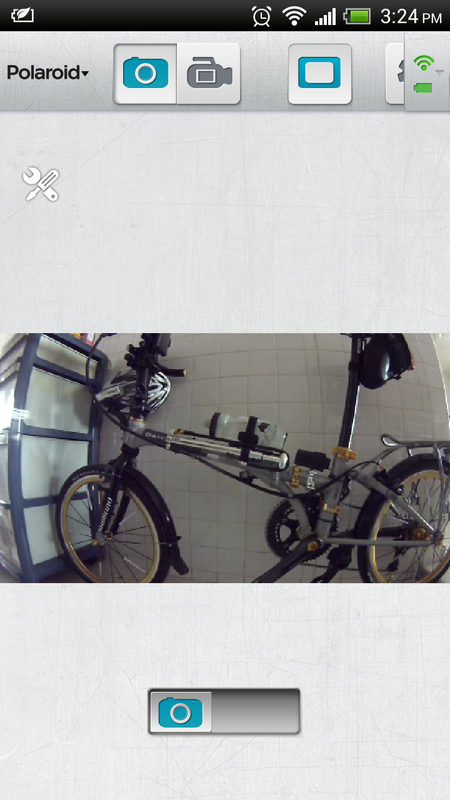 The Polaroid was placed just 50cm away from the bike, but managed to see the entire length of the bike as shown by the first picture above. In the photo mode, some basic settings can be made. The photo resolution can be selected, with a maximum of 16 megapixels available. The photo taking mode can also be changed from a standard mode, to burst mode, and even time lapse! This time lapse mode can be quite interesting, as it can help to create an accelerated video from the pictures taken. I have tried taking some pictures using the Polaroid, and it is quite OK. The most challenging part is that you can't really see what you are shooting! You can only point the camera in the general direction and press the shutter button. The upside is that the wide angle lens will ensure that the subject of your photo will most likely appear in the picture, since it captures such a wide viewing angle. Testing the Polaroid XS100i at the River Safari! Wide angle lens captures everything, but also means that objects will appear small in the picture. Setting the video modes is also possible using the phone. However, not all the options can be accessed directly from the phone itself through wifi. There is a hardware switch on the Polaroid itself that allows you to switch between Full HD and HD video modes. Rear panel of the Polaroid, when the waterproof cap is removed. There is a switch that allows you to select Full HD or HD video recording. How this works: First you need to select either Full HD or HD on the camera itself. 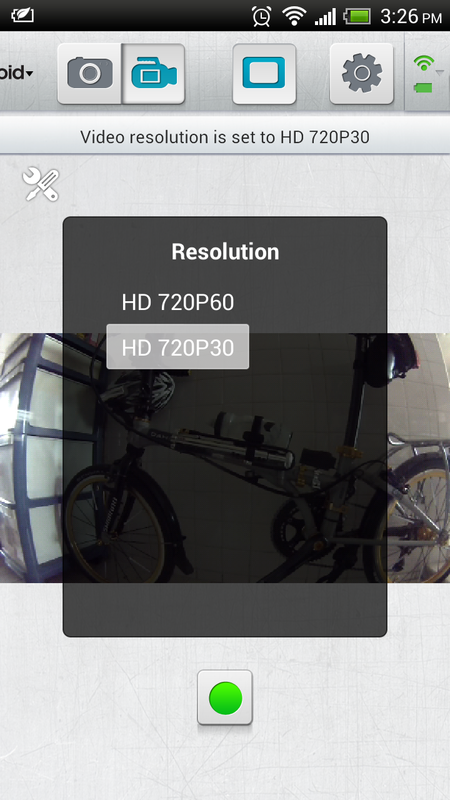 Once that is done, use the smartphone to make a secondary choice of video resolution. The camera will remember the settings, and will switch to your resolution choice when you use the hardware switch to select Full HD or HD mode. 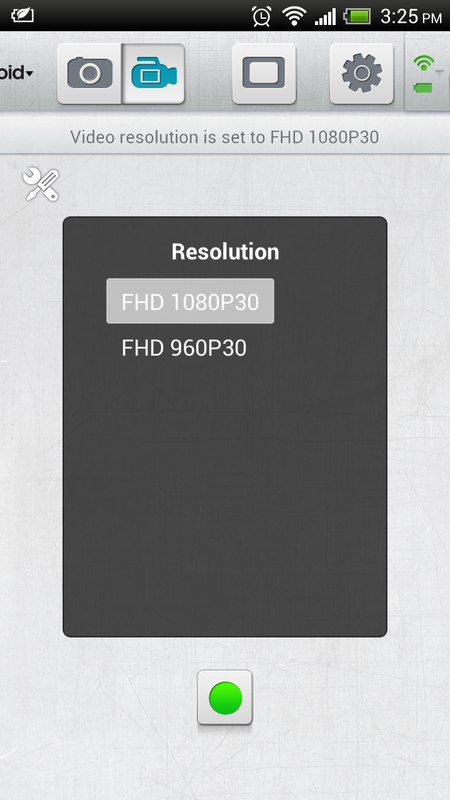 In Full HD mode, choose between 1080p at 30 FPS, or 960p at 30 FPS. In HD mode, choose between 720p at 60 FPS, or 720p at 30 FPS. 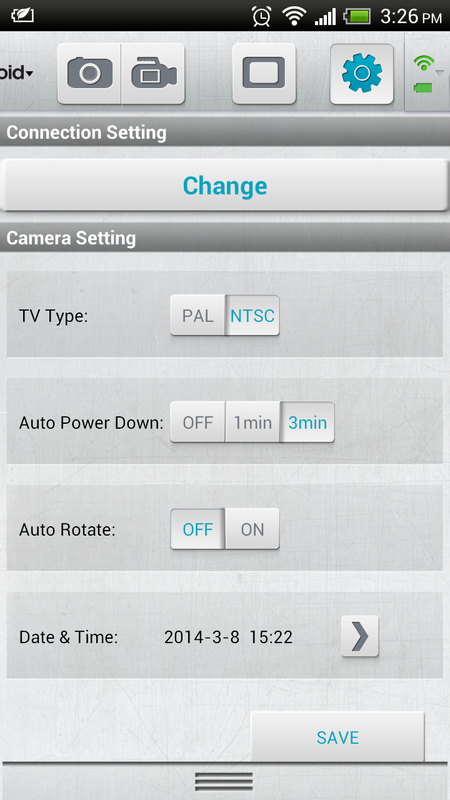 Other settings available for the Polaroid camera. So that's all for the options that are available! These options are more than sufficient for me, as I don't need to go into more detailed settings such as auto white balance or other more advanced options that may be available on other cameras. As for the videos, I will not be uploading any as the file sizes are too large. However, I can just describe the videos and its properties. One curious thing about the videos is that the video will cut off at a file size of exactly 3.66 GB. It seems that this could be due to the FAT32 formatting which limits the maximum possible file size to 4 GB. I did not reformat the Micro SD card when I first got it, I just inserted it into the camera and it worked. Reformatting the card to NTFS might increase the video size limit, but I am not sure if the camera can record in that format. Anyway, I am not too bothered about the file size limit. In fact, it can be good as it breaks up the videos into more manageable file sizes. I would not want to transfer a 10 or 20 GB video file from the camera to the computer! For Full HD recording, the details that can be seen in the video is really good. Car plate numbers can be seen clearly, and the colour rendering is pretty similar as what we see with our eyes. Given the recording resolution of 1080p at 30 FPS, the video cuts off at around 30 mins. As for HD 720p recording, it was done in the default 60 FPS mode. This means less details than 1080p but a higher frame rate. The lower detail is noticeable but still quite OK. It also seems that the video flows a bit smoother due to the higher frame rate? Although the resolution is lower, the higher frame rate means that the 720p 60 FPS video recording will actually cut off earlier than the 1080p, 30 FPS video. The video will cut off at around the 20 minute mark once the file size limit of 3.66 GB is reached. Now that the photo and video options are clear, let us move on to the camera mounting options! Mounting options and quality is very important for an action camera, as it can make or break a product. Just imagine if you have the best sport action camera, but the mounting is flimsy, unreliable and difficult to use? The camera would not be able to fulfill its intended purpose as it would fall off or tilt over easily. Therefore, when looking for an action camera, it is important to pay attention to the quality of the mounting, and not just look at the specifications of the camera. As previously described, I have installed two mounting options for the Polaroid XS100i. I used the helmet mount and the handlebar (handlepost actually) mount. For more details, check out the previous post here. After trying out the different mounting methods, I now have a good idea of the pros and cons of each of the mounting methods. The pros and cons of each method is summarized below. + High up, can see everything. + Ball joint remains in position and does not slip. + Less vibration than bike mount. + See exactly what you see as it turns with your head. + Can go with any bike, just wear the helmet with the camera! - Additional weight on top can cause helmet to tilt when traveling over bumps. - Not comfortable due to additional weight on helmet. Including mount, it doubles weight of helmet. Original helmet weight of the Kabuto MS-2 helmet is only 205 grams. - Picture moves whenever you turn your head, which can cause dizziness when viewing the video. - Sticks up too high above the helmet. A lower profile mount would have been better. + Does not affect helmet comfort, as the weight is borne by the bike. 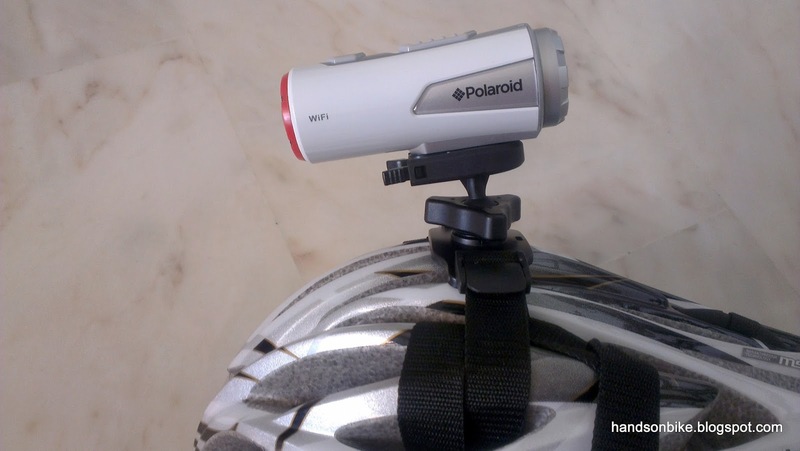 + Easy to start or stop recording even while riding as the LED can be seen from the rider's point of view. + Picture does not wander around unlike when mounted on the helmet. 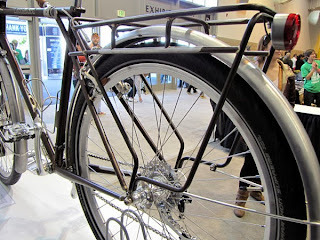 - Mount tends to tilt / sag when traveling over bumpy roads. 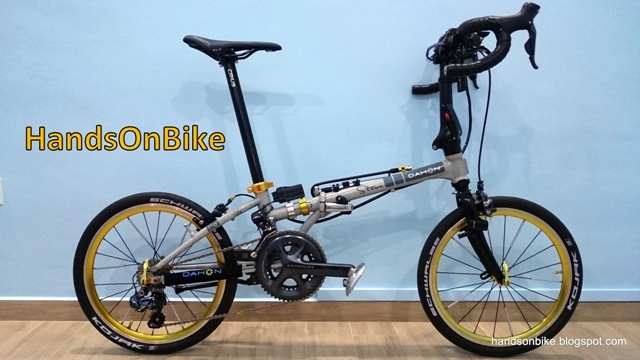 - More vibration in video, especially on uneven roads. To try to reduce the tilting of the ball joint mount on the handlepost, I used some Fiber Grip to increase friction, so that the camera weight does not cause the ball joint to slip. After testing it, I found that Fiber Grip actually works, although it is not perfect. There is still some slippage of the ball joint after a long and bumpy ride, but it has been much reduced. - Should have removable battery so that a spare battery can be swapped in. This will greatly extend the usage of the camera as the limitation here is not the storage space but the battery life. - Cannot take pictures while in video mode. - Cannot record video while USB cable is plugged in. - Cannot use loop video mode. - Low light clarity is OK only. - *.mov files does not have audio when played in Windows Media Player. Need to use Quicktime or VLC to play in order to have audio. - Micro SD card is not included. Need to buy separately (get high speed for best performance). Overall, I feel that this camera is quite value for money. For the price, I get most of the functions I require, and also all the necessary mounting parts. What is not so good is the design of the mounting. Although it works, it is not as secure as I would have liked, as it tends to move around a little. This would be a lower cost option to the GoPro, with probably 90% of the features at around 60% of the cost. For more details, please refer to the first part of the post. Hi! Great review! where did you get this cam here in singapore? Thanks! If you read the previous part of this review, I actually bought it from Amazon. Not sure if the wifi version is in Singapore or not. Nice review. I just purchased this camera. I cannot get any audio, Any suggestions? Try playing the video with quicktime or vlc player instead of windows media player. Hi may i know u purchase from which amazon seller and does it comes with warranty? Can't remember which seller. But there are very few people selling this, most likely it will be the same seller. Don't think there is warranty unless you are willing to send it back overseas. I tried to proceed with the few sellers but none of them can ship to Singapore when u proceed to checkout. This is the seller I bought the camera from. You can't ship directly to Singapore, you need to ship to a US address and use a service such as Comgateway to ship from US to Singapore. Thank you for your help, but how is the camera so far? As you know nowadays some products start to fall apart only after a few months. So far its fine, no issue at all. However, I have been using it rather sparingly, maybe only once a week. 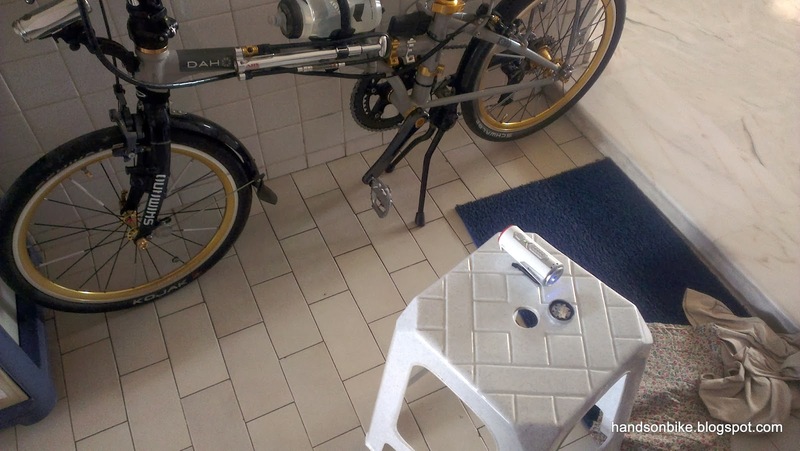 This is because it is mounted on my Dahon Boardwalk which I ride less frequently these days due to the unpredictable weather. Could you please clear one thing for me. Can you charge the camera and shoot video simultaneously? No that is not possible. I have tried it myself, and when the camera is charging, it will not record. Have you tried 2 pin usb charging cable, or just use regular usb/pc cable? I used the USB cable that is connected to the power adaptor. 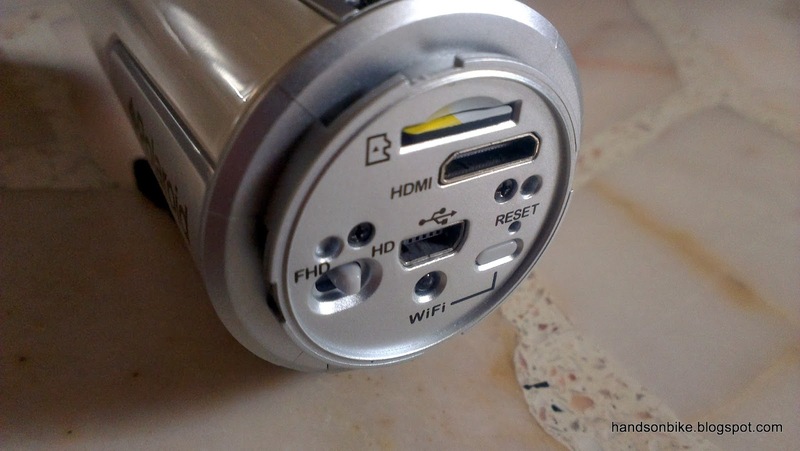 When connected to power adaptor or PC, the camera cannot record. It will only start charging or go into data mode when connected to PC. Hello thank you for the review. I am curious if you can mount it in a stick like you can a gopro? Just like this product so that you can hold it straight out and the camera will face you. This will not fit on a GoPro mount, as the mounting system is different. However, the Polaroid XS100i uses a standard camera screw mount, so you should be able to find something similar. A monopod will work. I have a Lenovo Thinkpad. Will I be able to download the videos and pictures I take straight to my computer? If so, is it easy to edit them and make a video? Thanks! Hi do you know where i can purchase additional mount kit? I know Amazon.com has it. I have no sound on my XS100i?